Experience the natural beauty of the Ikon Kitchen Stool Oak & Brown. Seated at standard kitchen height, its compact backless shape means it can be conveniently tucked away when not in use. Sure to enhance a variety of interior settings, the Ikon is a rustic stool to relish. Cushioned for comfort, the round padded seat is upholstered in fashionable brown faux leather, all supported by a solid wooden frame with a charming oak finish. Four sturdy legs lightly taper to the floor, with handy pads concealed beneath to protect a host of different floor surfaces. Feet can be rested on the polished chrome bracing bar, a trendy modern addition to the classic design. 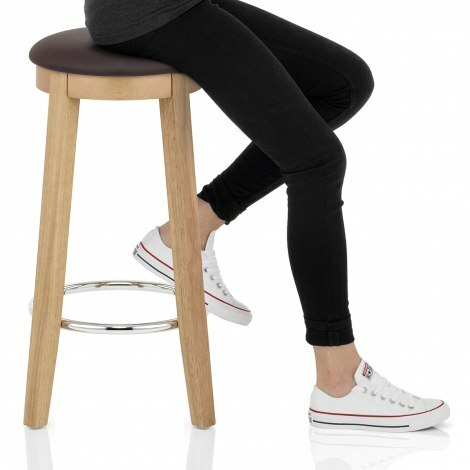 "Ideal height and looks great in the kitchen"
Good quality stool. Very sturdy. Easy to assemble. Good quality and perfect for my kitchen. Far more comfortable than plain wooden stools. Fab find! So pleased with everything from how easy to order, how quickly they arrived, how easy to put together and how great they look in my kitchen!! Love them! Very pleasing and looks good. Excellent service from Atlantic and DPD. Solid stool, easy to assemble. Lovely solid stool, easy to assemble, ideal height and looks great in the kitchen.